The pancreas is part of the digestive system and the endocrine system. The pancreas is a mixed gland, as it is both exocrine and endocrine. Its main functions are to produce digestive enzymes in the digestive tract and to regulate blood glucose concentration. 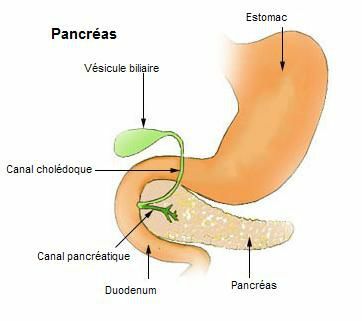 The pancreas produces pancreatic enzymes which are used by the digestive system, and empties them into the duodenum through the Wirsung duct. The proenzymes in pancreatic juice are inactive. They become active through the action of the gastric juice. and amylases (which degrade starch). Pancreatic juice has an alkaline pH, that neutralises the activity of chyme from the stomach. This is provided by the pancreatic islets of Langerhans, which are dispersed throughout the mass of the pancreas. The -α cells produce glucagon and the -β cells produce insulin, the two hormones involved in regulating blood glucose concentrations. Somatostatin and pancreatic polypeptide are produced by the -δ and F cells of the islets respectively. Somatostatin regulates gallbladder secretion, increases the mobility of the intestine and inhibits the production of glucagon and insulin. Pancreatic polypeptide plays a role in the inhibition of exocrine pancreatic secretion. The pancreas is located in the abdomen behind the stomach and in front of the kidneys. It is approximately 15 centimetres long and weighs 70 to 100 grams, making it the second largest gland in the human body after the liver. It has four parts: the head and isthmus that insert into the duodenum and the body and tail which extend to the spleen.